Greaves Cotton Ltd (GCL) is a diversified engineering company engaged in the manufacturing of diesel and petrol engines, gen-sets, agro equipment, aero engines, lightweight engine and construction equipment. The Company owns eleven manufacturing units located in the states of Maharashtra and Tamil Nadu. It has 10,000 touch points and 1,500 dealers across India & 25 distributors in the international market. GCL has ~75% market share in 3Wheeler diesel segment and has signed up with major OEMs for BS-VI 3W engines. This segment has been going through a prolonged phase of slowdown due to 1) preference towards four-wheeler small commercial vehicles 2) shift away from diesel engines due to environmental norms and 3) emergence of electric vehicles. GCL is responding to this challenge by de-risking its engine portfolio by positioning itself as a fuel-agnostic engine maker including electric mobility. It is planning for one 2W engine in the range of 110-115cc and one 3W engine in the range of 200-240cc. FY18 volumes for engines and power gen segment grew by 6% and 41% to 3.18 lakh and 4500 units while pumps and power tillers volumes de-grew by 11% and 13% to 80,000 and 3,300 units. The demand for 3W has a correlation with the CV segment due to the need for last mile connectivity. In recent months, the monthly volumes of CVs has shown a strong upturn, which has started to reflect on the demand for 3W. Auxiliary power segment market share has increased from 3.5% to 6.5% and has increased the range from 500KvA to 1250KvA. In the farm equipment segment it has ~45% market share in the petrol/kerosene pumps and is planning for electric & solar pumps in near future. GCL is strengthening its portfolio to address the entire crop cycle equipment needs. After market accounts for 20% of revenues and the portfolio can address ~80% of 3W ecosystem with GCL own parts and multi brand spare parts as well. Greaves Care an asset-light service model aimed at addressing complete service needs 3W & 4W. Currently 51 outlets are functional and GCL is planning to launch the service across India in a phased manner. Over the last year the Company’s margins had been impacted by 1) increase in material costs like steel and 2) transition into BS-IV engine which entailed cost increase of 8-10% on engine up gradation. During Q4FY18, the company took some price hikes in discussion with the OEMs, enabling it to restore margin loss of earlier quarters. GCL is an established name in the LCV diesel engine segment but has now also extended its capabilities to make multi-cylinder engines for small commercial vehicles of up to 3-3.5 tons, which opens up a significant market for the company. The Company is in talks with various OEMs to partner with them for their existing as well as future engine requirements in the multi-cylinder engine segment. GCL has signed technology agreement with Pinnacle Engines and Altigreen Propulsion Labs to launch clean energy 3W engines meeting BS IV norms. These engines score higher in terms of emission standards and fuel efficiency. The tie-up will also allow GCL to access export markets where three-wheeler vehicle are popular. The partnership also enables it to cater to the larger three-wheeler market for petrol and CNG space. GCL has launched new tiller variants in recent months and is expecting good numbers from the same. The Company expects to open ~ 50 stores of Greaves certified spare parts in FY19 through franchisee model & expects the franchisee to break even in a year. 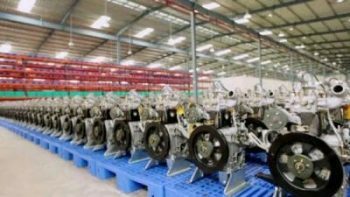 GCL has healthy return ratios, strong balance sheet, and leadership position in 3W engine manufacturing, attractive dividend payout and reasonable valuations.